[quote="Group B Models"]Group B models, together with my friend Olivier, are preparing the release of decals to build the Mark Reinesson 2011/2012. The model is now complete ( thank you Olivier) and should receive the decoration next week. Also the Pat Doran Monster Ford RS200 and his son Liam, should be out very soon. I will try and get Mark Rennison's contact details or get amessage to him to contact you when I'm speaking with Rob Gibson in the next few days. I presume you haven't been able to find him online, through Facebook or other sites? If you need Pat and/or Liam Dorans' contact details too I should be able to get those too, or again, pass your details to them to make contact with you. et me know. Top job, Mark! Is it the very same RS200 used at Pikes Peak as in the DSRM livery from the 1987 season? I guess you could consider 1150 bhp as 'adequate' by anyone's standards! They've tarmac'd the road to the top now, so that loses much of the challenge. Still, I've still got the full, loose surface on Colin McRae Dirt 2 on my PS3! Certainly do, Olivier! That was a wonderful project, as are your latest ones. Beautiful work! Nice to see you popping back on to the Forum here. Hope to hear from again soon. Don't be a stranger! Group B Models wrote: Group B models, together with my friend Olivier, are preparing the release of decals to build the Mark Reinesson 2011/2012. I can not translate this sentence??? Ce n'est pas un problème Olivier! Bien sûr, vous pouvez créer un modèle Doran RS200 - Graham (Cardy) a été juste vous montrer son modèle de la même voiture. Beautiful, Olivier. Thanks for sharing these photographs. Very interesting to see the build of the model. Olivier will apply them this week. Can`t wait to see the final result. It is definitely NOT Gloss Black for sure Olivier, and I do not think it is Matt Black either! It looks like Satin Black to me, which is half way between Gloss and Matt. Can you understand that? Indeed, excellent work on the model Olivier, AND to you Vitor on the decals! 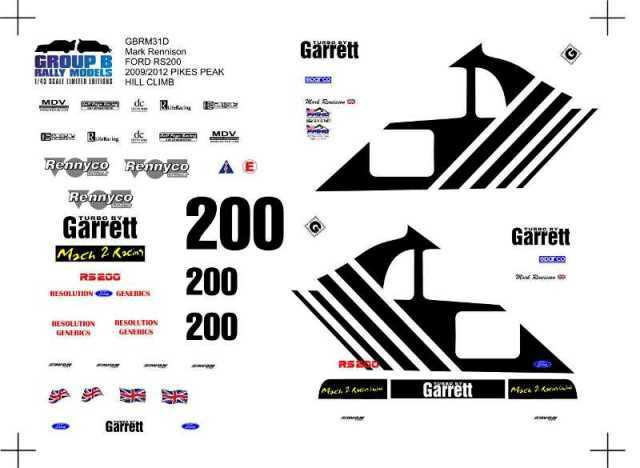 BOTH RS200s will look very impressive once finished! Cowley wrote: It is definitely NOT Gloss Black for sure Olivier, and I do not think it is Matt Black either! For all the new Monster sponsor cars, the black is not gloss but more like matt. Some friends already build the Ken Block cars, and they painted the car in gloss black. This allows decals to adhere better. After they apply matt clear coat from automotive lacquers.